It’s a given nowadays that at some point in our distant ancestral past, bipedal and no doubt hirsute forebears marched out of Africa. Thousands of years later, mine showed up in Northern Europe, from whence they sailed to North America only hundreds of years ago—hardly a blink in the continuum of time. But in the millennia between the African exodus and their establishment in the British Isles and Northern France, where were they? What were they doing? I have no idea in specific terms. But in general terms, the limestone rocks and caves of Southern France offer rich clues to our passage from nomadic early humans to our present, early 21st century version of Homo sapiens sapiens—Sapiens for short. 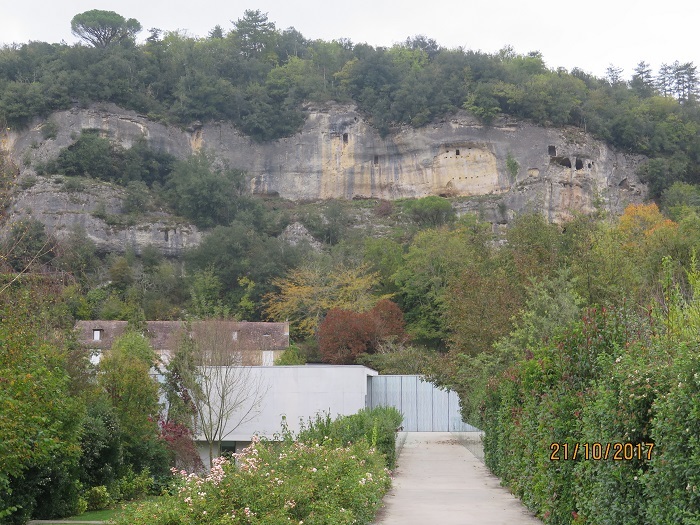 I had only to look at the extravagant limestone cliff overhangs in Les Eyziers en Tayac—with what appear to be window holes in them—to see the ways that rocks and stones connect us through time. For there, below the ledges that sheltered early humans, dwellings, hotels and restaurants are still built into the same rocks. 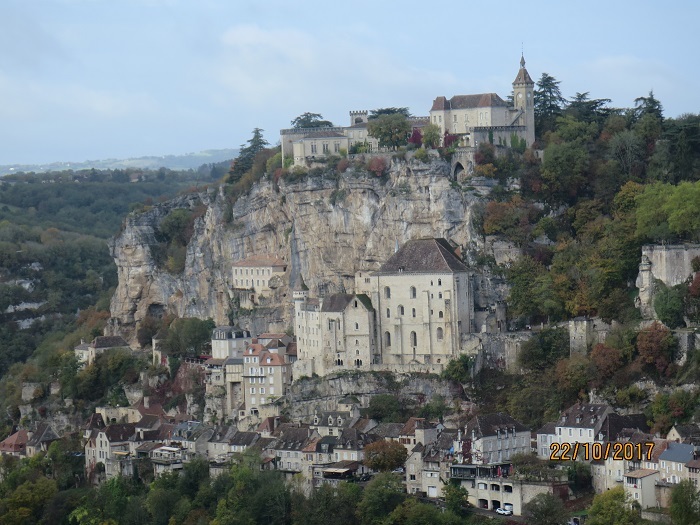 And elsewhere, in nearby Rocamadour above the Dordogne River, for example, castles and church spires tower over an entire medieval town spun from rock, making its residents truly cliff dwellers. But our remote ancestors did not actually live inside cliffs any more than they lived in caves—which were too damp, dark and dangerous to occupy. What they did is take and make shelter there—and in many cases extraordinary and symbolic works of art—while they lived in portable shelters, rather like the Plains Indians of North America. These were easier to heat and pack up for relocation when the need arose for hunting. Les Eyziers is the site of Le Musée National de Préhistoire of France, and as such, houses artifacts, displays and an astonishing number of flint tools which were the bedrock of the stone-age culture. 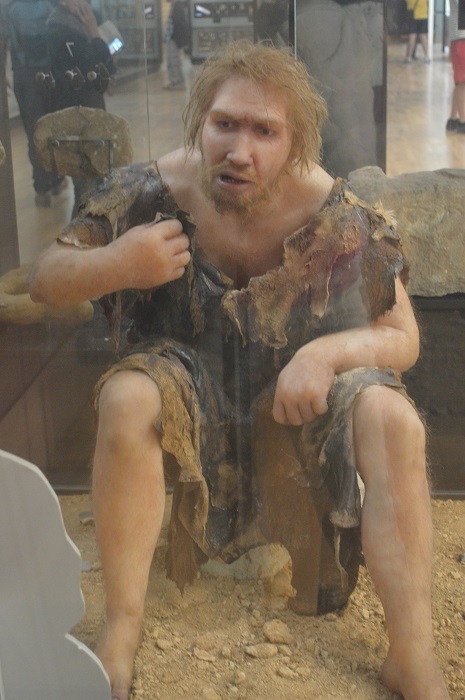 But for me, hunting my ancestors, what stopped me in my tracks was the model, based on fossil remains, of a Neanderthal woman (named Wilma to be sure) and her baby. Her slightly furrowed forehead told me that it was no easy thing to bring up and protect that child in the environment in which they lived, a small ice age with tundra to live upon and herds of wild animals their best resource for survival. But what also moved me was her coloring—reddish wisps of hair over freckled white skin and gray-green eyes. The coloring of members of my family. This, of course, is quite possible considering that for most people of European (and Asian) ancestry, Neanderthals are us. For several thousand years, beginning about 40,000 years ago, the two species, Neanderthal and Sapiens, coexisted until the Neanderthal…disappeared. There are many ideas about what happened, but one thing is certain: in part they disappeared into us. 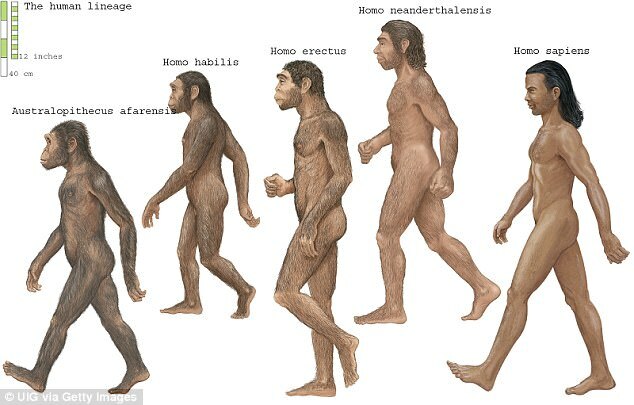 From 1%-4% of the DNA of most modern Europeans and Asians is Neanderthal. Even as the Neanderthals were beginning to fade, an even closer ancestor, Cro-Magnon, was busy making highly sophisticated art inside caves throughout Southern Europe and the Middle East. For me, experiencing the images inside the reconstructed cave of Lascaux II was astonishing. The cave itself is small, and was discovered in 1940 by four teenage boys in what is now a lush woodland. The pictures, with one exception only of animals, project colors and a realistic knowledge of the animals’ anatomy and movements that become transformed into stylized scenes of ritualistic meaning. 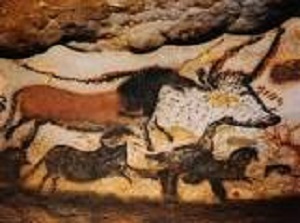 Many experts believe the paintings are shamanistic, and the shamans themselves are seen in the form of horses that disappear beyond the rocks, symbolizing that they themselves also go beyond the known world into one unseen. The portrayal of light, shadows and movement would be best seen by torches carried into the darkness. Although there are also many different theories about the meaning of these cave paintings, one aspect of them seems beyond dispute: that the rock structure with its arches overhead and its narrowing passages leads the artist, and the viewer, deeper and deeper into the heart of a mystery. And that the space is a sacred one. Not unlike modern places of worship inside stone structures with domes, narrow passageways, and refracted, mysterious light. 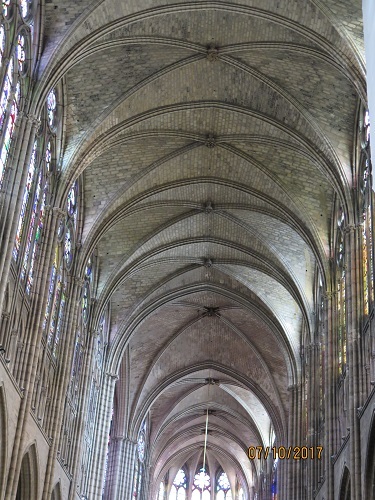 Not unlike European Gothic cathedrals, with their high arching ribs, their stained glass windows and candles scattering holy light, their altars inside naves containing the heart of their mysteries. I sense my ancestors felt at home first in one, then migrated to the other.